Imagine having to pay a massive amount less for your energy bills – it’s the stuff of many thrifty businesses’ dreams, especially when the cost of gas and electricity seem to be rising far too much. Although it might seem like a strange idea that may never come to fruition, having your own renewable energy source can help to achieve that dream, especially with solar panels. Installing solar panels from dulas.org.uk can help to save your business a lot of money, especially if you are a high energy user. Solar power is an energy source that can be relied upon all year round, even when the weather’s not necessarily sunny. How it works is that rays from the sun are beamed towards the panels, which then convert that light into electricity. The energy generated can then be used for a variety of purposes all year round, and any unused electricity can be placed back into the national grid, which is good to know. There are two main types of solar panel,which are useful for different reasons. 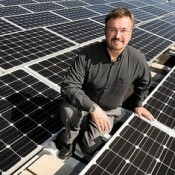 Perhaps the most common type of panels available for sale is photovoltaic. Photovoltaic solar panels are designed for everyday use, and are perhaps the most reliable. They work all year round, can generate electricity with ease, and are at their most effective when installed on a roof. For larger offices and warehouses, it’s advisable to use larger scale installations to make sure you get the energy needed. Ideal for any office that runs 24-7, thermal solar panels heat water efficiently throughout the year, as well as helping to make central heating systems work. They’re perfect for winter, when hot water is deemed by many as being a necessity.